At the wake of a resounding triumph in the One-Day International (ODI) series, a confident Rohit Sharma-led Men in Blue will take to the field against New Zealand in a first of the three-match Twenty20 International (T20I) series. At the wake of a resounding triumph in the One-Day International (ODI) series, a confident Rohit Sharma-led Men in Blue will take to the field against New Zealand in a first of the three-match Twenty20 International (T20I) series. 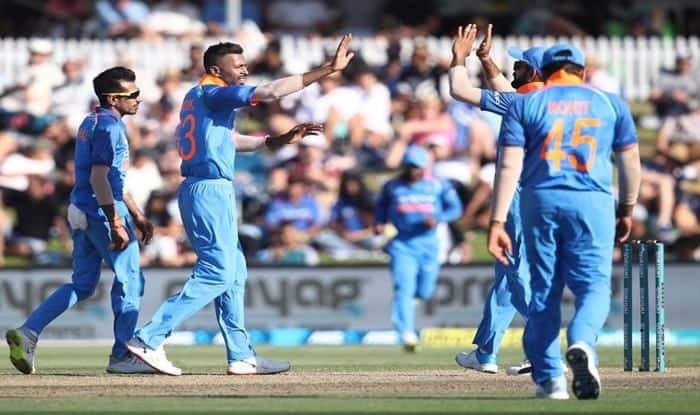 The Indian cricket team will look to conclude their final tour ahead of the world cup on a high and a win against the Blackcaps at the Westpac Stadium on Wednesday will provide them a boost to maintain their momentum. When is the India vs New Zealand 1st T20I? The India vs New Zealand 1st T20I will be played on February 6, 2019. Where will the India vs New Zealand 1st T20I be played? The India vs New Zealand 1st T20I will be played at the Westpac Stadium, Wellington. What time does the India vs New Zealand 1st T20I begin? The India vs New Zealand 1st T20I will begin at 12:30 PM IST. Which TV channels will broadcast the India vs New Zealand 1st T20I? The India vs New Zealand 1st T20I will be telecast on the Star Sports Network. How do I watch the live streaming of the India vs New Zealand 1st T20I? The live streaming of the India vs New Zealand 1st T20I will be available on Hotstar. You can also catch the live updates on India.com/sports. India: Rohit Sharma, Shikhar Dhawan, Virat Kohli (Captain), MS Dhoni (wicket-keeper), Kedar Jadhav, Dinesh Karthik, Vijay Shankar, Ravindra Jadeja, Bhuvneshwar Kumar, Mohammed Shami, Yuzvendra Chahal, Ambati Rayudu, Shubman Gill, Kuldeep Yadav, Mohammed Siraj, Khaleel Ahmed, Hardik Pandya. New Zealand: Martin Guptill, Colin Munro, Kane Williamson (captain), Ross Taylor, Tom Latham (wicket-keeper), Colin de Grandhomme, Mitchell Santner, Tim Southee, Ish Sodhi, Trent Boult, Lockie Ferguson, Henry Nicholls, Doug Bracewell, Matt Henry.